There were winners aplenty on the Twitter scene, as @RayCotolo plowed through winners last weekend and this past weekend. Let’s start with last weekend’s results, which happened after press time for our blog review and move to the successes the week later. Remember to stay connected to Twitter with Frank and Ray Cotolo for late suggestions to play including exotics. Follow and wager from TwinSpires. Get onto our mailing list to learn how to get upcoming horses to watch by clicking here. We split in Saturday’s quartet of “Levy” races. We had the first division with Valentino ($5.50) and the second division with Razzle Dazzle ($7.70). The other two divisions did not offer any surprises, with the highest price of all four Levys at $8.90. From the horses-to-watch list we scored at Buffalo with Golden Terror, paying $33. At Cal Expo, the ticket we loved produced nothing. In fact, the winners were all instant toss-outs for us. Our best suggested contenders finished second, second, third and last due to a bad break. 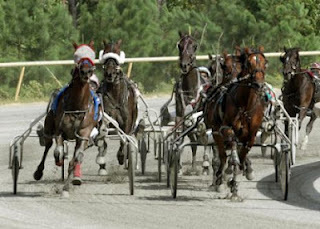 On April 28 the 2012 Grand Circuit gets underway in harness racing (if eliminations are necessary to the first event of the circuit). Otherwise the string of races at 17 stops through the rest of the year begins on the first Saturday in May. That day, of course, the main attraction in horse racing is at Churchill Downs, which hosts the Kentucky Derby. Also that day, Freehold hosts the Dexter Cup (for soph-colt trotters), which launches our exclusive Hambletonian Trail blog. The “Trail” goes three monhs, from the Dexter Cup to the Hambletonian (Aug. 5) and during that time we will, in concert with the Hambletonian Society, cover all of the preps for Hambo-eligibles of both sexes, which includes the soph-filly trotters’ Hambletonian Oaks. The events involved are mostly on Grand Circuit stops, which include Hoosier, Goshen (no wagering), Pocono, Tioga, the Meadows and the Meadowlands. Other events for the two divisions will appear elsewhere at North America tracks and we will be reporting on them as well. There will be prizes and surprises along the way with a lot of stakes and wagering action leading to the giant day of racing on Aug. 4, where we will again report live. Stay with TwinSpires and the Hambletonian Society to take in all of the great trotting action and betting opportunities in this exclusive teaming for harness bettors. The Meadowlands’ winter meet is over. The track is dark next weekend, April 27-28. Live racing resumes Friday, May 4 for the Championship Meet that takes us to the Hambletonian. New Jersey sire Rocknroll Hanover is currently leading all pacing sires in the money-winning category in 2012. His sons and daughters have banked $2,816,035 so far this year with 234 starters from 606 foals. His offspring lead runner-up Camluck ($2,401,342 with 328 starters from 1,694 foals) by more than $400,000, according to Perretti Farms, where “Rocknroll” stands stud. Two of his sons are major three-year-old prospects: A Rocknroll Dance and Pet Rock. In the glamour-boy pacer division they are pointing toward the New Jersey Sire Stakes opening leg on May 19 at the Meadowlands.